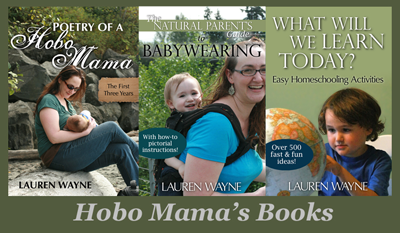 Hobo Mama: Eco & edible gift ideas for the holidays! BlogHer's got a bunch of great gift guides up for the holiday, and I just went window shopping to find a few gifts sure to be loved by naturally minded givers and receivers. One of my favorites from the charitable gift ideas is the gift of manure — yup! Give a charitable donation to OxFam Unwrapped to "show your loved ones that you really 'give a $%@#' for our planet." Ha ha ha! Only $12 to inspire some eco-loving in your recipients. Another charitable idea for well-loved and big-hearted folks who have everything? Ask them to give back! Send them on an all-expenses-paid volunteer vacation to do something like help build and maintain trails in national parks from the American Hiking Society. How about some edible treats? Got a crunchy granola hostess or relative to butter up? Why not do it with granola! Pumpkin Granola from GoodBakes is easy to prepare and put into a lovely jar. Plus, it will keep well to bring along on a trip or ship through the mail. For the tea lover, try the Christmas Spiced Tea Mix from Plain Chicken in a jar or tin — mmm! Spiced tea says holidays right there. What are the gifts you're giving or hoping to receive this holiday season? Point me toward the best stores and tutorials, stat! This post is part of BlogHer's Holiday Gift Guides editorial series, sponsored by Open Road Media. The thoughts and recommendations are my own. See my full disclosure policy here.